It’s nearly Mother’s Day. As we celebrate mums across the world, there’s something we shouldn’t forget about modern mums. And it’s that we’re busy. Yes, I’m sure mums have always been, to be fair. But we’re in constant go-go-go mode all day, every day. The internet is full of advice on how to be more organised and productive. On how to make sure you get the message that you should be up at 5 am, do yoga, meditate, go for a run, spend time on some form of gratitude practice, and only then, be ready to get the children up with a smile and go on with your day. The expectation on modern mums is that we’ve got to do it all. There’s pressure coming from every corner. External pressure, for sure. But let’s be honest, isn’t some of this pressure coming from within? Are we piling too much on ourselves? Tell me, are you guilty of putting yourself under a lot of pressure? How does pressure make us feel? They all recognised these feelings. But above all, they all said they felt guilty about feeling like that! The fact that guilt is a key ingredient of motherhood isn’t new information. And on that note, if you haven’t already, you should pick up a copy of The Supermum Myth, by Anya Hayes. It includes a very nice section on guilt (and all the other emotions and feelings we seem to experience on a daily basis). So it may be quite ‘normal’ that we use the above words to describe our feelings and emotions. But is it right that we do? How can we NOT feel frazzled, stressed and exhausted? We’re always so busy and have so much to juggle at any one time that we’re forever rushing around, chasing our tails and maybe not doing anything as well as we would like to. In 2016, when I was still working part-time in the corporate world, I was heading towards burnout. Our three boys were still young and while I was at work they were meant to be in different places (one in school, one at nursery and a toddler still at home) so they had different drop off and pick-up times, and the logistic of it all was a bit of a nightmare. I felt like I was always rushing around like the proverbial headless chicken. Truth is, a lot of the pressure I was under came from me. I used to put myself under a huge amount of pressure. But more than anything, I used to put pressure on myself to be a more present mum for my children. And I wasn’t doing it well enough. It looked like all the other mums around me could do it all so easily. But I couldn’t. In fact, often I felt like my head was about to explode! Back in 2016, before I decided to hand in my notice at my job, my body started falling apart a little bit too – I was always run down, with headaches and frequent colds. I wasn’t sleeping well (or long enough), and I was completely shattered. All. The. Time. When asked whether I could be stressed, I used to say that my job wasn’t demanding enough. After all, I wasn’t a big solicitor in the City working late into the night, was I?! I was ‘just a normal mum’ trying to do everything. Trying to be the best I could be. Because that’s what all mums do. So why should I expect any less from myself? It turns out I was indeed stressed. And sadly, for a very long time, I ignored all the signs. I carried on. And I kept pushing. The only reason why I didn’t burn out is that in September 2016 I broke my leg. And I was forced to take a good look in the mirror (so to speak) and start making changes. You can listen to my story in this podcast interview: Taking Off the Blinkers and Waking up to Life, with Sara Bussandri. So what do we do to reduce the pressure? 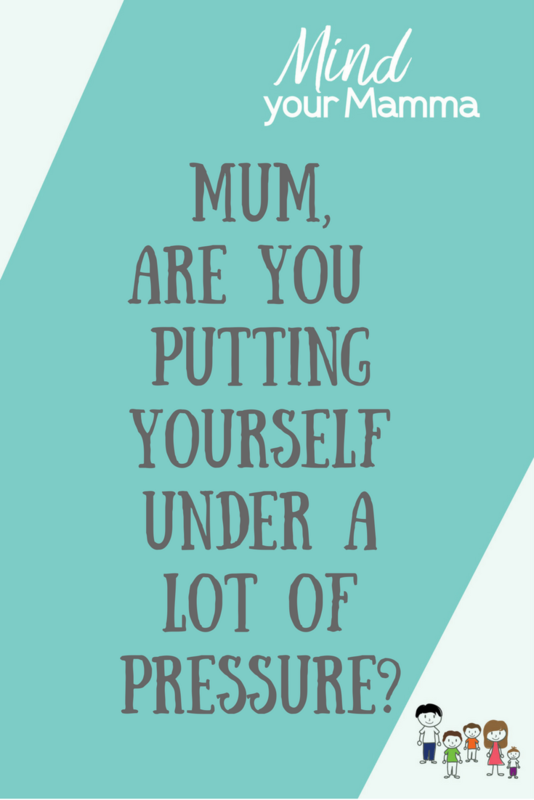 What needs to change, really, for us mums so we can put ourselves under less pressure? So much of it comes from outside. Society, the media, and in particular social media, are giving us the impression that mums can have it all and should settle for no less. The perception that everyone else ‘has it together’ makes it harder for the mums who are struggling to come forward, ask for help, or simply raise their hand and say: “You know what, I’m not weak. But this is too much, and I can’t or don’t want to do it all”. Unfortunately, I don’t have the solution. I’m not going to fix this one on my own and in one blog post. But I can tell you what has been helping me in the last 18 months, since breaking my leg. 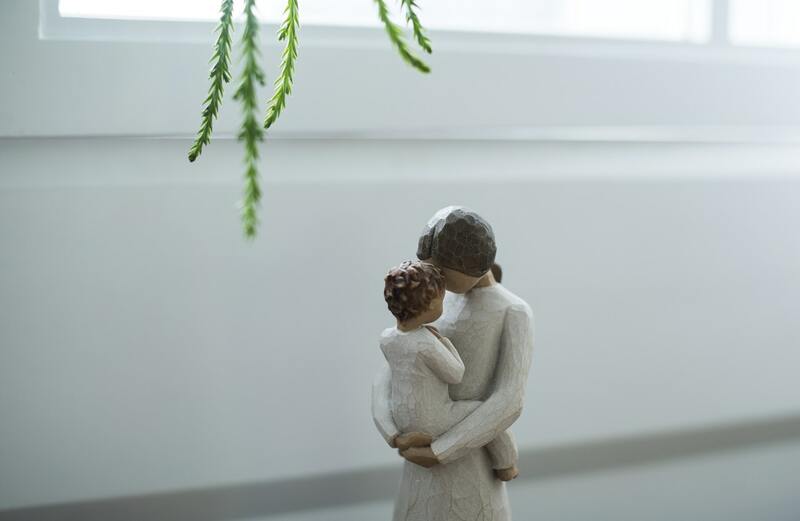 I can tell you what small things I’ve been working on to become less stressed, feel more balanced, calmer and more present with my children – physically but also mentally and emotionally. The first thing I did when I realised I couldn’t carry on the way I was living (or rather, surviving to the next bedtime or weekend) was to work out what I could change. The obvious thing for me was my job. While I don’t think a career change is for everyone, I don’t believe you can create real change for yourself without taking a hard look at each area of your life. We spend so much of our lives working (whether it’s a ‘traditional’ job or running our own businesses) that we can’t ignore what we do for a living. And if it’s not right for us in the season of life we’re in, maybe it’s time to make some changes. I do work, actually. I am a writer, and I work from home. Overall, this ‘taking stock’ process has meant embarking on a journey of self-awareness and self-discovery. I’ve definitely learnt a huge amount about myself, and I’m quite happy to keep going. If we’re always so rushed, why can’t we change the pace of our lives a little? Can we not start to say no when too much is too much? When we’ve crammed too much in? Can we not try to introduce more time in between activities wherever we can? And do things that allow us to live at a slightly slower pace? But we can also try to learn to let go and stop the need to control everything and strive for perfection in every single thing we do because these are exactly the things that pile all the pressure on in the first place, aren’t they? Have you heard the saying: “You can’t keep doing the same thing and expect different results”? It’s true, right? If you want to change the way you feel about things, you’ve got to change your perspective and mindset for starters. But you also need to change some of the things you do. Sometimes that’s easy to do. Other times you need some inspiration. And do you know what the quickest way to bring new people, new ideas, and new information into your life is? Reading. Books allow you to do all that and more! Do you have a list of books you’d like to read? If so, go and buy the next book on your list. If not, check out the app Blinkist. It allows you to discover new books every day – you can read or listen to the key points of a book in about 15 minutes and then decide if you want to read the full copy. Let’s take a step back from all the doing, if we can. If we feel we can make the time. If we don’t find it too boring. Or too hard. I’m a big believer that mindfulness IS for everyone. But sitting on a cushion on the floor for 20 minutes meditating every single morning at 5 am IS NOT. Luckily that’s not the only thing we can do to become more mindful, to be more in the present, and to worry less about the future. Thinking that long meditation sessions are the only way to achieve this makes mindfulness prescriptive and inaccessible. And it turns it into something that’s NOT for everyone at any given point in their lives. For me, bringing more mindfulness into your life doesn’t have to be taxing or complicated. If it is, then it adds pressure to your life, instead of taking it away. So have a read of these posts. I’d love to know what you think. A review of the Aware meditation app – download it now! – you’ll find a little discount code in this post too. It’s easy (way too easy) to let our habits drive what we do and how we do it. If we’re not careful, we can slip into auto-pilot. Which is why, when you take stock, you’ve got to look at what’s important. Step back and look at the bigger picture. So, if you haven’t already, spend some time thinking about your values. What matters to you the most? What drives you? How do you want your life to be x years from now? And is whatever’s on your to-do list right now helping you to get there? If you can’t do it alone, ask for help. Get some support. Last summer I took a group coaching course called How to Lead a Gentle Life with Life Coach Emily Hodge, and it helped me to get clarity on what I wanted out of my life going forward. I made a vision board during that course which is still right behind my computer screen – I see it every day and love it! It’s a bunch of words, quotes and images on a big poster, but it helps my decision-making. That’s how powerful intention can be. Sure, we can do all this ‘stuff’, but does it work? Sometimes it does. Sometimes it doesn’t. Personally, I’ll you that putting myself under an enormous amount of pressure every single day didn’t serve me well. Not at all. I was spreading myself so thin that I wasn’t doing anything well. Through self-awareness, intention, and commitment, I re-invented myself. I went from being the stressed, frazzled and constantly overwhelmed (broken-legged) mum that I was to being a much calmer and more balanced version of myself. I’m more present for my children. Like I said, it doesn’t always work. I still have my ‘bad days’ like everyone else. But the point is, as mums, we’re all busy. We know and accept the fact that often (and especially when they’re so little) we have no choice but to put the needs of our children before our own. But our children do grow up – they get a little older every day and over time they need us in different ways. We don’t win a medal by running ourselves into the ground trying to achieve perfection in every aspect of life. In fact, when we do that, we risk losing the race altogether. Our children need us to be healthy, happy and present. I struggled. I got myself stressed and injured. And I nearly burnt out. So I learnt the hard way that putting myself under so much pressure wasn’t the answer. I don’t believe that mindless busyness and stress are acceptable parts of motherhood. They are indeed ‘normal’ – in that so many of us experience them. But I don’t think we should just accept them as part and parcel of motherhood. We owe it to ourselves not to. And to most of all, we owe it to our children. What do you think? Do you put yourself under too much pressure and end up being super-busy and stressed out in the process? Wouldn’t you like for things to be different? Next Post The morning routines of real people – what do we do when we get up? thanks for sharing this…i really feel the wight sometimes.but thanks!such a great read! I’m glad it resonates Candid – I know the feeling. And if it’s possible for you, do consider ‘sharing the load’, whether physically or mentally, with someone close to you.